It is “this land” – or rather the dark, rich fertile soil packed deep throughout Mississippi – that does bind us all together, especially when it reaps a fresh and hearty bounty that, in turn, we are able to enjoy together and even share on a global level. Thanks to this fertile land, not only is agriculture a booming, billion-dollar industry in the state, it also is responsible for nearly 30 percent of Mississippi’s workforce, either directly or indirectly. Rooted deeply in our rural areas, it currently represents more than 35,800 farms. As today’s lifestyle and food trends are increasingly centered around simplicity, people are more conscientious about the sustainability of their food as well as more intentional to buy from and support local businesses. Understanding the significance of this movement, the Mississippi Department of Agriculture and Commerce recently launched Genuine MS, a branding program that fosters the agriculture industry in a variety of ways and includes four product classifications: Grown (crops and produce); Raised (livestock, dairy, apiary, seafood and aquaculture); Crafted (food and beverages; hand-crafted items made of agricultural or natural resources); and Made (manufactured items at least 51 percent manufactured in Mississippi). 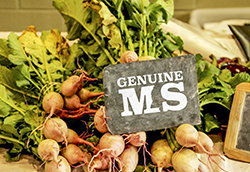 Genuine MS products range from fruits, vegetables, honey, mushrooms, nuts and popcorn to seafood, beef, lamb and pork and even tap into organic skincare products, bakery items, jewelry, farm equipment, timber and Christmas trees. “As Mississippians, we have a great deal to be proud of, and the Genuine MS program focuses on the many things Mississippi has to offer,” noted Gipson. 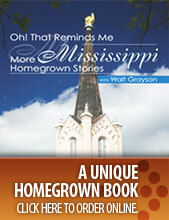 As Hodding Carter so eloquently acknowledged, “this land” certainly does provide us a familiar and welcomed sense of togetherness, especially when that takes the shape of homegrown goodness filling our dinner tables and discoveries of other such agriculturally-inspired products and services that call Mississippi home.